Raise your hand if you love leggings! ? Raise your hand if you wear leggings when you aren’t in the gym! ?If you raised your hand to either one of those things than this athleisure look is for you! There’s a fine line between looking athleisure chic and athleisure slob. The trick is being able to take your gym clothes to street style seamlessly. I like to have a pair of sneakers for working out/dance and one pair for cute outfits or athleisure looks. This ensures they stay in good shape and won’t get dirty or messed up. 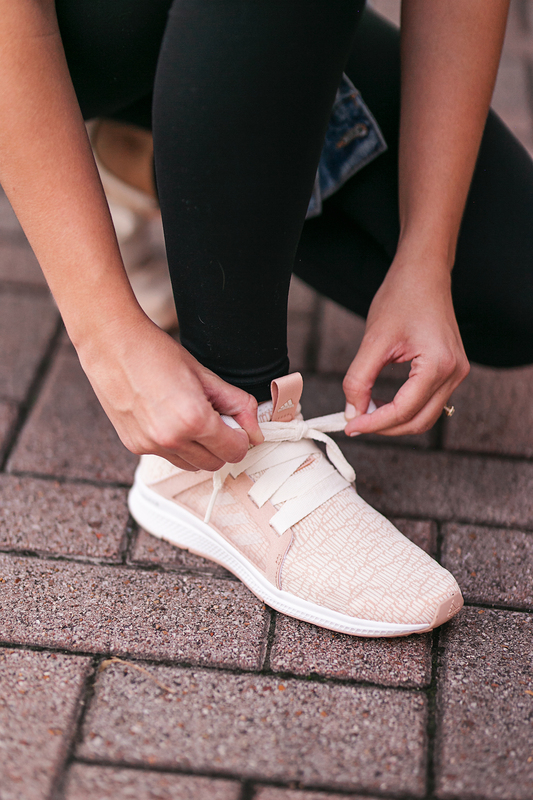 This pair of sneakers from Adidas is perfect because the pink color feels ultra feminine and the wide laces give them a little something extra. The best part is they are super affordable at only $60!! I personally don’t like to wear leggings unless I have something covering my bottom. 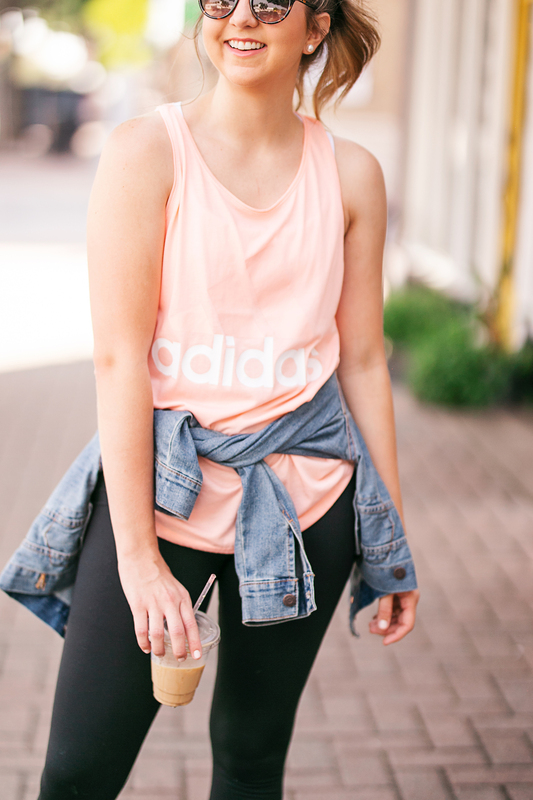 I chose to tie this denim jacket around my waist for a little more coverage and then opted for this pink Adidas tank top. I actually wore this same outfit minus the sneakers and denim jacket to my dance class last week and swapped out items for this look once I left the studio. 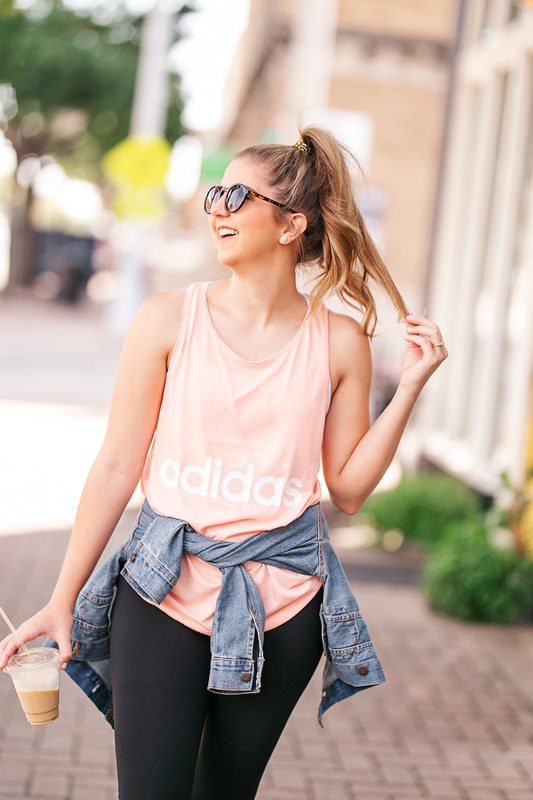 This tank is perfect to wear as I did here or to tie up in a knot when working out and with a cute sports bra, you’ll look great in the gym or on the street. 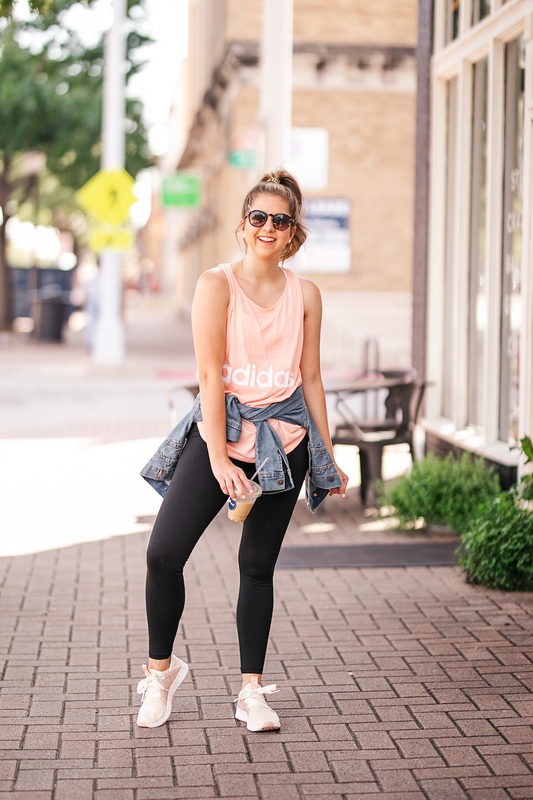 This casual athleisure look is easy to achieve whether you are heading out for coffee and errands or hitting the streets after working out. *This post is sponsored by Adidas, but all opinions are my own. Posts like this make Thrifty Pineapple possible! You are too sweet! Hope you are doing well! Omg those earrings are beautiful ???? I’ve been looking for a pair of sneakers to wear casually! These are perfect, and I love how affordable they are! These are PERFECT! I highly recommend! Love the sporty look!! I need those shoes in my life!! Thanks girl! I have been living in them lately! Love my leggings… gym or not ? Always looking for new athlesiure and comfy sneakers! The purple earrings are so cute for days when I feel like getting out of my leggings!! I am obsessed with these sneakers! So cute and feminine AND affordable! I agree I love wearing a longer shirt with leggings but they are just so comfy!! Yes, just makes me feel a little more covered! Does running to target count as working out? Love the outfit! I feel the same way about leggings and my bottom! Modest is the hottest ? Love wearing leggings when running errands, especially with a cute pair of sneakers!! And I never knew I needed lavender earrings until your instastory, SO CUTE! Love your blog and Instagram page! Are the sneakers good for actual activity? Running, cross-training, etc.? Love the way the look but wondering if they’re also functional! Also, love the purple earrings! Hey sister! To be honest, I don’t really work out with heavy activity so I can’t give an opinion here. So sorry!! I love the purple earrings! This article is great since I love wearing leggings. The purple earrings you posted on your Instagram were so cute! Adore this outfit!! And those purple earrings are perfect! I’m a TSU ALUM & love super close to TCU! Super cute earrings! And outfit of course too! LOVE this look!! My favorite part has to be the shoes. I’m a sucker for some new/cute kicks? Congratulations! You’re the winner! Please email me to claim your prize!! Haha working out is always better with cute clothes! That would be a real look! You could totally rock it! 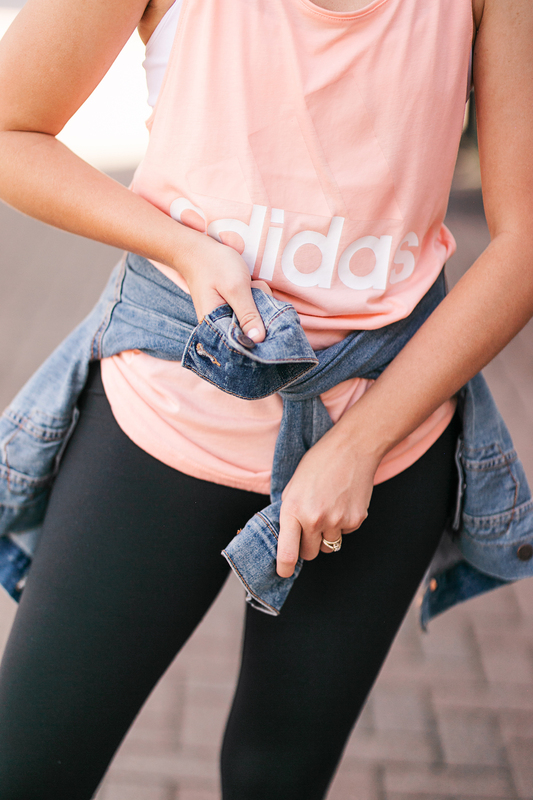 Love the denim jacket with the workout clothes! Love this workout outfit! Especially the shoes!